Effective protection against friction burns and decubitus ulcer on sensitive elbow. Provides the comfortable cushioing of plush synthetic sheepskin. Pad held securely in place. 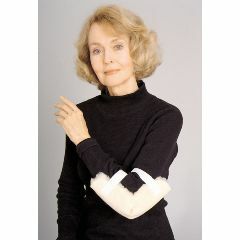 AllegroMedical.com presents The Elbow Protector Pad. Effective protection against friction burns and decubitus ulcer on sensitive elbow. Provides the comfortable cushioing of plush synthetic sheepskin. Pad held securely in place. Launderable.